Our London cleaners undergo one of the industry’s most rigorous selection processes. Less than 1% make the grade. We’ve cleaned over 10,000 homes in London and are proud to have an average service rating of over 90 percent. Maisonette or mansion, we ensure that every property is cleaned to the same exacting standards. HOW MUCH WILL YOUR CLEAN COST? Our standard checklist ensures every room is thoroughly cleaned — we never cut corners. Simply select the number of hours cleaning you would like, and we’ll do the rest. All cleaning products included. If you’re unhappy with our work, we’ll re-clean your place for free – no questions asked! Good communication between you and your house cleaner is vital so all our staff speak excellent English. Our cleaners are consistently monitored for client feedback and we only keep on the very best. If you need us to provide cleaning products, then that’s not a problem at all. We can bring these with us for a small additional fee. 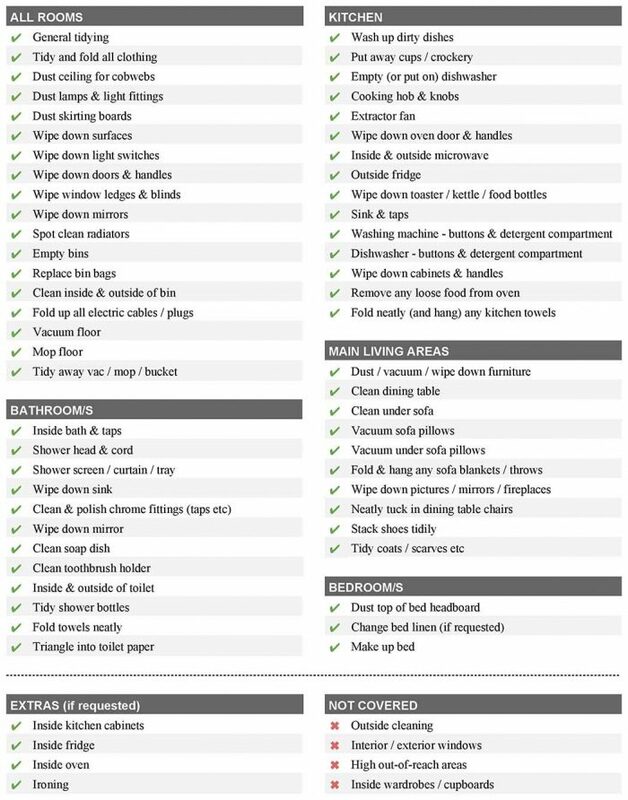 We recommend budgeting 30-min per kitchen / bathroom / living-area / bedroom to cover a standard checklist like the below. You can also add extra services such as ironing and oven cleaning, depending on your needs. If you’ve stayed in a five-star hotel, you’ll know how immaculately clean the rooms are — and we apply the same meticulous attention-to-detail to cleaning your home. In fact, many of our cleaners have 5-star hotel experience from some of London’s most prestigious hotels, including The Ritz, Claridge’s and The Connaught. WHAT MAKES US THE BEST DOMESTIC CLEANING COMPANY IN LONDON? It’s a bold statement but we genuinely believe that our London cleaners represent the best of the best. Ultimately, the quality of our house cleaning service starts with cleaner recruitment and being able to attract the very best candidates. As London’s premium domestic cleaning agency, our rates are higher than average but importantly, this allows us to pay a good and fair rate to our cleaners. Paying towards the top of the market allows us to attract a large volume of cleaners in London who apply to work with us. This volume of applications then gives us the luxury to cherrypick the very best cleaners London has to offer. We typically get hundreds of applications every week, interview around 100 but then make just 1 offer. It seems fairly simplistic but paying a higher rate is a major reason why our cleaners value their job more highly than a lower paying competitor. In an industry when cleaner turnover is typically less than 3-months, our London cleaners stay for approximately 4x longer than the industry average. As our clients place great emphasis on trust, having greater continuity is highly valued. We find that once our clients find us, that they tend to stay with us for a long time, recommending us to their friends and family along the way. Once we’ve identified and on-boarded our new cleaners, this however represents just the start. Next comes the 1-month trial where we carefully monitor how these new cleaners are working - both in terms of client ratings as well as assessing other factors such as professionalism and reliability. To continue working with us, new cleaners need to have at least a 90% average client rating. As you might imagine, the number of cleaners who pass their first month is just a fraction of those that start. But once we find these cleaning superstars, they tend to stay with us for a long time making many of our clients very happy in the process! As is hopefully apparent, we focus a huge amount of time and resource attracting and retaining the very best cleaners London has to offer. 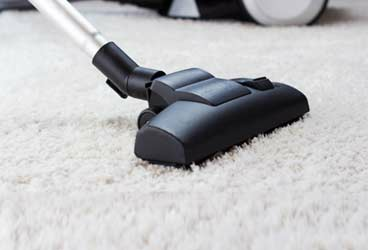 But our goal to be the best cleaning company in London involves a number of other key things as well, namely around customer service. Although we try to minimise problems, some inevitably still occur and our customer services team are trained to deal with such issues in a timely manner that is satisfactory to the client. Online reviews and word-of-mouth referrals are extremely important to us. And you’ll see when you compare our reviews to other domestic cleaning services in London, that ours are well on top. Unfortunately things do go wrong but rest assured, we’ll always be here to put ourselves in your shoes and to resolve any problems as swiftly as possible. The best house cleaning agency I have ever worked with. So polite and efficient. Jurgita, our cleaner, is the best we ever had. as well as the obvious things she has great attention to detail and does all the tiny jobs (like descaling the kettle) that really make all the difference. Can't recommend enough! Really impressed with Neat cleaning services and Mariela. It's not just the cleaning, which is faultless, but the administration and service which is always polite and efficient. The whole package gives us total peace of mind and the knowledge that everything will be taken care of without our having to worry about it. Very impressed with Neat . The cleaning standard is very high and the head office are very easy to deal with, quick and efficient. Always lovely having a clean flat to return home to after a busy day. Would definitely recommend. We really like the work Ionela is doing, she is efficient, works hard, very consistent and also really personable. The standard is high everywhere, particularly the bathroom fixtures which always look sparkling clean! We are very pleased with Gabriela, she is very thorough and always leaves the flat perfect. Her cleaning is the best we have experienced and she is very reliable which is highly appreciated. Absolutely fantastic house cleaning service, Olivia and Faith are so thorough, the house looks brand new after each visit. They are lovely lovely girls, I really can't sing their praises high enough. Thank you!